[0:05] <meshnetn00b> Hey guys. How reasonable would it be to go from some programming experience, but not python or html, to getting my rpi to respond to ssh commands that changes the color of an hdmi connected display? [0:05] <meshnetn00b> ... within this evening? [0:06] <meshnetn00b> And what fundamental skills do I need to research for this? [0:41] <PotatoGuy> Hi guys, im a software developer working with hardware for the first time! I want to create "lego" like pieces that know which pieces are connected to each other, and their orientation. Is something like this possible with the pi? [0:52] <ShorTie> like 3d print ?? [0:53] <Willd> But with electronics, I guess? [0:56] <HrdwrBoB> but that is electronics? [0:59] <PotatoGuy> Ye, something like the above. The idea is to have several pieces (eg wheel, propeller, pipe, etc) that can be connected with each other in all sort of different configurations. I need a way to determine how each piece is connected which each other. [1:15] <willc> Is the BCM12 similar to the 18? [2:43] <chisight> willc: what are you trying to with combining an output pin and a device that outputs a signal? [2:52] <chisight> ahh, so all you need is any old input and to poll it regularly or to use a tool like pigpio to poll it for you. [3:00] <chisight> willc: i see nothing in that article about bcm18 being "particularly useful" for this task. [3:02] <willc> My background is primarily Web and so this hardware stuff I'm still mapping my mind around. [3:03] <chisight> ^^^ no benefit to wasting the high value pwm and mosi pin on reading a light sensor. [3:12] <willc> So does that mean BCM12 would act the same as BCM18? [3:24] <chisight> using a $10 pi for reading a single pin and reporting it somewhere over wireless seem like real overkill. i guess if this is the only automation task you expect to do for awhile, it has pretty low setup investment. [3:37] <chisight> the esp8266 is stand alone, no other board needed. [3:39] <chisight> yeah, the esp-12 is not the smallest but is the cheapest currently. the really small ones are more than a pi. [3:39] <chisight> not familiar with that one. [3:47] <chisight> the esp-m3 appears to be a hair bigger than the esp-12 but is a few cents cheaper and breadboard friendly. seems a nice variant. [3:55] <chisight> hmm, it is smaller. it uses a different shield that is smaller. [3:56] <chisight> gpio0 isnt on the breadboard connector, so unless there is the gpio0 resistor inside that can, you have to solder one. [4:00] <chisight> then it runs your code and does whatever you programmed it to do. [4:01] <Kryczek> is it capable of multitasking? [4:01] <chisight> in this case, read two gpio pins and report when either goes high. [4:02] <Kryczek> or the idea is to have it purely emit its own readings over WiFi? [4:02] <chisight> it's a microcontroller, there are lots of things it can do with enough software. [4:03] <chisight> there is even an rtos variant available. [4:03] <willc> Could I run two sensors off of one of those? [4:04] <chisight> Kryczek: it's pretty similar, but amazon went with another brand. [4:05] <chisight> yes, in concept, pretty identical. [4:06] <Kryczek> ah yes! I was wondering: does it perhaps support some kind of meshing by itself? [4:06] <chisight> yep. lots of software's been written. [4:08] <chisight> since when? isn't the robo-tender esp based? it pours and could do coffee. [4:08] <shauno> I've wanted to add a pid to mine for years. using an esp8266 would mean it could communicate with my alarm clock too ..
[4:10] <chisight> the esp8266 even has a sleep mode, so it can run on battery if you don't need it to wake up often. [4:10] <Kryczek> and I imagine that sleep mode can be interrupted by one of the GPIO pins? 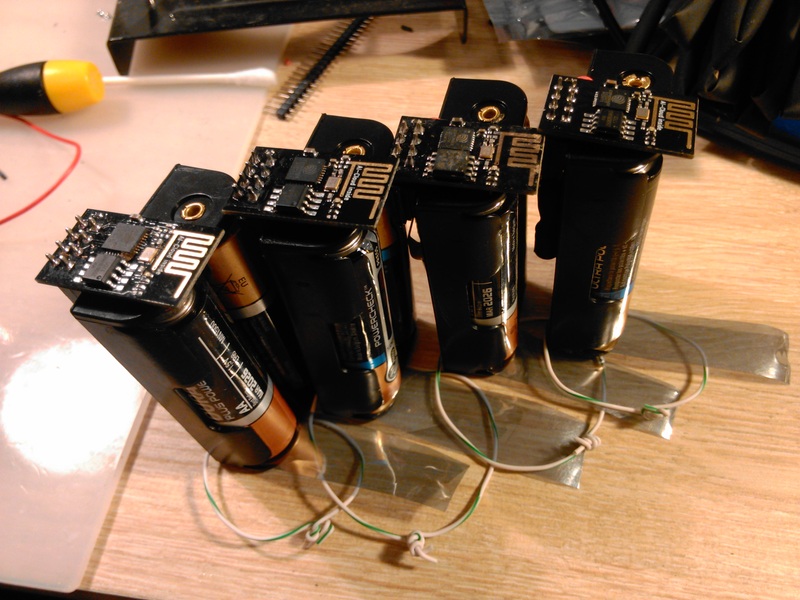 [4:11] <chisight> in the fridge monitor project, that means one extra resistor lets you run the sensor off battery for almost as long as the battery self discharge rate will allow. [4:11] <Kryczek> redrabbit: how do the repeater know to wake up in time to hear the signal that they need to repeat? [4:12] <Kryczek> no risk of clock drift? [4:13] <chisight> Kryczek: you just request a sync over wifi each time you wake up, or maybe only once an hour. [4:15] <chisight> assuming temperatures don't change too fast, i imagine drift could be predicted to under 1 second an hour. [4:22] <Kryczek> "Internet connectivity in the Upside Down"
[4:23] <chisight> might work even better, slippery. [4:24] <chisight> once up, you'd have to tie both ends of the string tightly down so that the wind can't tangle it up. [4:25] <chisight> yeah, i imagine it does. [4:25] <chisight> fishing line is cheap though. [4:27] <chisight> this is why you keep both ends at the bottom. so you can make a loop to raise and lower the esp. [4:27] <Kryczek> combine them with bird houses? [4:28] <chisight> a mid weight 15lb test line should handle just about anything as long as your tiedown has some give to it. [4:29] <chisight> how many pounds test? [4:29] <Kryczek> how heavy is the thing now? [4:30] <chisight> the strength is to overcome being battered by moving branches and to pull tight enough that the wind doesn't tie it in knots. [4:35] <chisight> i bet the can makes range and reliability a bit better. [4:38] <chisight> ahh, that does sound painful. i solder the en pin on an mp1584en or the dtr on ch340g. the esp8266 is an even smaller pitch than those. [4:40] <chisight> they make microscopes for that, but trial and error is cheaper and works too. [4:41] <chisight> i've recently started using a 2" magnifying glass as a macro lens for my phone camera. works pretty good at getting closer than it normally could. [4:43] <chisight> earlier today i used it to finally identify the markings on a particularly small chip that i'd been having trouble identifying. [4:50] <chisight> oh, i recently got my first tv since the 80486 came out... i wonder if it can do ntsc or only atsc. [4:53] <chisight> i have had an atsc card for a long time. it's back in it's box collecting dust and has been for a few years now. [4:54] <chisight> tv just doesn't do much for me. i don't like youtube even, tutorials or documentation should be text with graphics when needed. [4:55] <chisight> my smartphone does text! [4:55] <chisight> i'm typing on it now. [4:55] <HrdwrBoB> my smartphone runs linux in text only mode. [4:56] <chisight> same, though terminals and on screen keyboards are not very compatible. [4:58] <chisight> samsung came out with a really stupid portrait mode keyboard for this phone, the buttons are too small to use. [5:00] <chisight> i don't care if it's 1/2 inch thick, i want my replaceable battery and my slider back. [5:01] <chisight> yeah, i know... wishful thinking. never going to get what i want. [5:02] <chisight> someday i may have enough prototyping equipment to make a slider, but i don't have it now. [5:21] <meshnetn00b> has anyone here tried Picroft on a 2B? I see one site saying it has to be at least a pi 3, but another says 2b or 3. [5:59] <chisight> HrdwrBoB: then you're in the wrong channel. the rest of us in here are insane. that's why nobody thought twice about your message. [6:02] <shauno> speak for yourself. I'm operating within normal parameters. [6:07] <chisight> though i was on a smartphone with a screen keyboard and do want my slider back at almost any cost. [6:08] <nsk_nyc> Anyone who use berryboot know why the wpa_supplicant.conf file goes missing after random boots? [8:08] <wallmonitorcable> I have a "Raspberry Pi 700MHz Arm CPU 512MB RAM", ordered in 2014. Is there such a thing as a minimal OS that is self-updating/self-maintaining with zero maintenance required by me that I can put on it? [8:09] <wallmonitorcable> I only wanna be able to run PHP (command line) scripts, access a PostgreSQL database (no performance required) and use the Internet connection (wired). [8:09] <wallmonitorcable> Remotely, that is. It will be headless. [8:10] <wallmonitorcable> Used as a sort of server 24/7. I hope that's not a problem for the Raspberry Pi? [8:21] <wallmonitorcable> Annoyingly, it says "(c)2011.12" on the actual unit... What does that mean? [8:49] <wallmonitorcable> Why would a database not run? 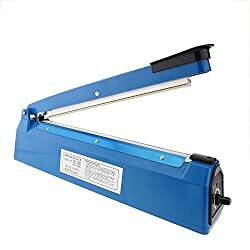 How weak is this thing? [8:51] <wallmonitorcable> Why have they not thought of building in automatic updates? No user is going to babysit and keep track of every patch. [8:53] <wallmonitorcable> Having to log in and type that command constantly is BABYSITTING. [8:53] <wallmonitorcable> That's the world of idiocy. [8:54] <wallmonitorcable> This should've been fully automated since the 1980s. [8:54] <wallmonitorcable> It only breaks things if the developers are idiots. [8:54] <wallmonitorcable> And don't test stuff. [10:34] <shiftplusone> Also, raspbian has packages added added by raspberry pi, which don't go through experimental/testing repos. It's impossible for developers to test every single use case, since many people do things which only work by accident rather than because it's meant to work that way. [10:36] <shiftplusone> It's inevitable that some updates may break things for some people. It has nothing to do with developers being idiots. [10:39] <shiftplusone> mfa298: as well as they know the hardware, mistakes happen or decisions which are unpopular with some segment of the users are sometimes made. [10:43] <shiftplusone> certain /dev/ permissions, passwordless sudo and pkexec or something else? 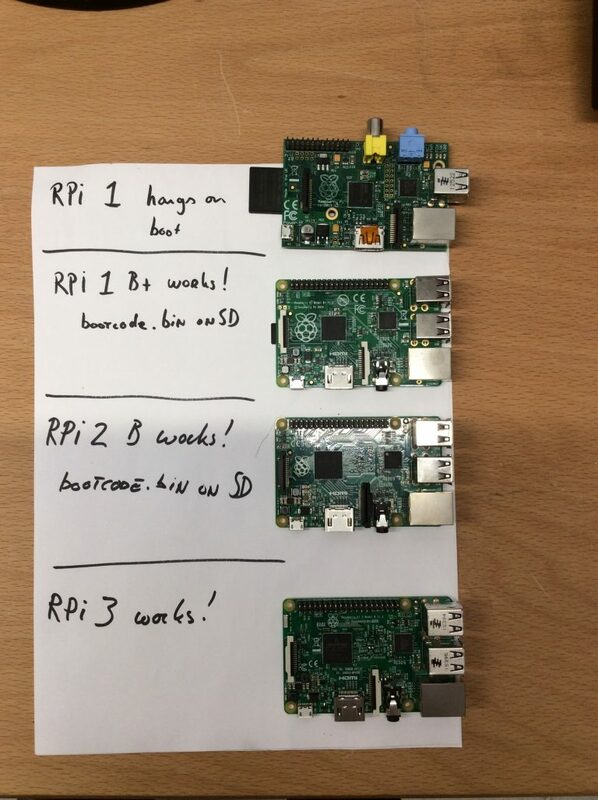 [10:49] <BurtyB> shiftplusone, https://github.com/raspberrypi/usbboot/pull/27#pullrequestreview-85008240 I can plug a bit of hardware into the USB port of a machine running rpiboot and retrieve any file the process can access. [10:51] <shiftplusone> right now rpiboot requires root permissions to run though, right? [10:52] <shiftplusone> yup, makes sense. [10:54] <myxenovia> what is the latest raspberry pi 3 with 2 ethernet? [10:54] <shiftplusone> BurtyB: wouldn't the machine need to be configured to serve that file? [10:55] <shiftplusone> myxenovia: What? If I am parsing that correctly.... there's is no pi with 2 ethernet ports. [10:58] <shiftplusone> ah, since the rpiboot serves files requested... got it. [10:59] <myxenovia> shiftplusone okay. well what is the model of rpi with greatest specs? [10:59] <myxenovia> is rpi 3 model B the greatest specs no? [10:59] <shiftplusone> myxenovia: it is indeed. [11:00] <myxenovia> oq is that going to be a custom rpi? [11:01] <shiftplusone> myxenovia: what's it actually running? Which desktop environment? What's lagging? Is it the browser? [11:02] <shiftplusone> myxenovia: where are you noticing the lag? [11:03] <shiftplusone> myxenovia: to word it another way, what are you doing at the time you notice the lag? [11:04] <shiftplusone> oq: nope, that's not it. [11:06] <shiftplusone> myxenovia: it's best to do one thing at a time. Multitasking like that is probably going to be painful. If you want a faster browser, take a look at vivaldi - it seems to have better feedback than chromium. There's a special pi build. [16:37] <chisight> shouldn't a zero always try to output to hdmi? i just booted with the monitor not connected and when i connected it, i'm not getting video. still at the defaults in /boot/config.txt so i've not forced the mode yet. [16:40] <chisight> even pis that don't have a composite out like the zero 1.3? [16:40] <chisight> i know how to set the config.txt. i'm trying to avoid the dirty shutdown. [16:40] <Habbie> what dirty shutdown? [16:41] <chisight> pulling the plug because the head isn't working. [16:41] <chisight> any hints what keys it would take to do a clean shutdown? i don't normally have a head on a pi. [16:42] <chisight> i haven't soldered headers on yet, so no serial yet. [16:43] <chisight> so when outputting to composite, the gui doesn't start? [16:43] <mfa298> shows how rarely I shut my pis down. [16:45] <takane2> I have a gsm modem connected via usb and it seems like everyboot one of two kernel drivers is loaded for it which changes the device name. Anyway to make it stick with one or the other? [16:45] <chisight> did ctrl alt f1 then pi enter raspberry enter pi enter raspberry enter poweroff enter. [16:45] <chisight> got one blink of the green led and the led is steady on still. will the green light go out when it's safely shutdown? [16:47] <akk> When it's shut down the red light will be on, green off. [16:48] <akk> Does ctrl-alt-f1 get a console on raspbian? I'm on Debian here, and X is on ctrl-alt-f1. [16:48] <chisight> my zero 1.3 doesn't seem to have a red led. [16:48] <Habbie> ld50, what revision pi2? [16:49] <akk> oh, yeah, led behavior is different on different models, ignore what I said about red/green since I don't have a pi2. [16:50] <chisight> the other guy has the 2b, i'm on a zero 1.3 trying to do the clean shutdown. [16:50] <chisight> the 2b does have the same lights as a b+ and 3b. [16:53] <Habbie> ld50, note the 'bootcode.bin on SD' bit, do you have that? [17:04] <mfa298> the github url looks like the one linked from the page so that's probably the safest one to try. [17:05] <ld50> it works. damn. wow. what a relief. [17:05] <mfa298> might be worth trying with a usb boot stick first and see if that comes up. [17:23] <chisight> serial console appears to not be enabled by default anymore on a pi zero 1.3 using the 2017-11-29 image. i was able to get the steady slow blinks and then no light by pressing ctrl-alt-delete, waiting, pressing ctrl-alt-f2, entering pi enter raspberry enter sudo bash enter poweroff enter. [17:24] <chisight> thanks for the help Habbie and mfa298. ld50, it would have been nice had you waited until i was done before hopping in. [17:25] <ld50> chisight: sorry, i didn't mean to interrupt anything. i'm used to irc channels where n conversations are going on at the same time. [17:26] <chisight> needless to say, the iron is heating, ssh is being touched, the config.txt is being edited to enable 1080p forced hdmi. [17:27] <chisight> ld50: yeah, so am i. not sure why this one seems to be so single threaded. it isn't always. [17:29] <chisight> and after all that, i had not dismounted the right image before i started. my "perfect, clean install" image wasn't perfect anyway. [17:31] <chisight> i got no response from anyone, including you when the other guy popped up. anyway, nevermind. starting this image over. [18:02] <darsie> Can any of the P1 ground pins carry the full supply current? [18:03] <darsie> Or should I better use two? [18:03] <darsie> Or the one next to the 5 V pins? [18:03] <darsie> They have such small traces to the ground plane. [18:17] <Unicorn437> Do I have to change a setting for it to use IPv4, or is there a different solution? [18:24] <akk> except it looks like it disabled the normal wpa-supplicant configuration for wlan0. [18:24] <akk> I'd like to have both wlan0 and usb0 configured. [18:25] <akk> Should I be configuring usb0's static IP through wpa-supplicant? Or putting something in interfaces telling it to use wpa-supplicant for wlan0? [18:27] <akk> I guess if I want to keep wpa-supplicant's auto network detection, then, the answer is to add a wpa_supplicant.conf entry to configure usb0 with static ip? [18:27] <Lartza> Did you read at all what I wrote? [18:28] <akk> Yes, and I'd like to keep using it for wifi -- its network detection has been working well for me. [18:28] <akk> The question is how I can add usb0. [18:29] <akk> Okay, I see. I'll read up on how to configure dhcpd directly. [18:32] <Unicorn437> hmm, I have an idea on what the issue might be, although the error output on the pi itself is lacking. Do I need to use (") to have a password with spaces, or do other escapes in the settings.ini? [18:40] <akk> Thanks, Lartza, configuring dhcpcd.conf worked great. [18:45] <akk> Lartza: Sorry, I'm old. :) ip is the replacement I should be using, right? [18:46] <akk> I keep meaning to learn ip syntax but ifconfig keeps working so I've been lazy about it. Okay, I'll look it up right now. [18:51] <akk> Yeah, since ifconfig still works fine, it's hard to get motivated as long as it's still available everywhere. [19:02] <akk> Interesting. I knew it would happen eventually. [19:05] <akk> If I do "ip a add 192.168.7.1/24 dev enp0s26u1u1", can I mark it as up in the same line, like I could with ifconfig? [19:05] <akk> Or do I have to do a separate "ip link set dev enp0s26u1u1 up" command? [19:05] <Habbie> akk, you mean mark en0p* up? [19:07] <akk> and its output is cleaner (fits in 80 columns). [19:07] <Habbie> also my desktop doesn't have "ip"
[19:07] <akk> But it's good to have the impetus to write my cheatsheet so I can use ip when I need to. [19:08] <akk> Some day I need to rewrite my python netutils module to use ip instead of ifconfig, but that's a bigger job. [19:08] <Habbie> shouldn't it use netlink? [19:09] <akk> I didn't know about netlink. Maybe it should! [19:09] <akk> It would sure be nice to have an alternative to parsing output from commands. [19:10] <akk> Thanks, I will read up. [19:10] <Habbie> https://pypi.python.org/pypi/netutils-linux/ is yours? [19:12] <akk> If pyroute2 works for all the networks I use, I'd be happy to ditch most of my code and use someone else's. [19:12] <akk> Actually I doubt if anyone but me uses my netutils library. [19:13] <akk> It doesn't have a lot of stars or followers in github, so I don't think it's particularly popular. [19:13] <Habbie> it's not on pypi? [19:14] <akk> No, I wasn't confident that it would work everywhere since it relies on ifconfig/ifup/etc. and parsing their output. [19:15] <akk> It has worked pretty reliably for me for 10 years or so (with occasional tweaks as command output changes) but it might break on other distros etc. [19:15] <akk> no, this module is very linux specific, not at all cross platform. [19:16] <akk> For most things I try to be cross platform but I couldn't see any way to do it with this one. [19:16] <akk> farther from being cross platform? [19:16] <akk> That wouldn't be a problem. But it would be nice to be more solidly cross-distro. [19:17] <Habbie> distro or OS? [19:17] <Habbie> out of fashion because systemd? [19:17] <akk> No, it happened before systemd. [19:18] <akk> but for a while they both made some NetworkManager-related changes that made /etc/network/interfaces much less reliable. [19:19] <akk> Even if you didn't have NetworkManager installed (I always uninstall it) there were other changes under the hood that assumed it was there. [19:20] <akk> But ifup/ifdown didn't work reliably either, so for a while I was constantly bouncing back and forth between that and interfaces. [19:20] <akk> Fortunately things eventually settled down. [19:22] <Habbie> what do schemes mean here? [19:23] <akk> and there is a cli client now (there wasn't for years) but even that never worked right for me. [19:23] <akk> not that my schemes are perfect either, but they actually work more reliably for me than either of those two. [19:24] <akk> I do have to admit that the raspbian wpa-supplicant thing seems to work remarkably well. [19:24] <akk> But of course that's new, it wasn't around for 90% of the time I've been using my schemes. [19:33] <mfa298> akk: reading some of the scrollback, I think a lot of internals like that will be different between all OSes so trying to make cross platform in an easy way is hard - even the output of ifconfig can vary between different oses. [19:33] <akk> mfa298: Yes, very true. [19:34] <akk> That netlink interface looks like it might be a lot more standard, though, so I'm looking forward to reading about that. [19:37] <mfa298> aiui netlink is the kernel interface for twiddling the various knobs, so it's what the likes of ifconfig, ip, route etc. talk to. [19:37] <mfa298> but as the netlink interfaces have changed i dont think the older tools (ifconfig) have necessarily kept up so what they can do is limited now. [19:38] <akk> Off to a meeting, nice chatting, thanks again for the help. [19:42] <Habbie> akk, ok, have a great rest of day! [20:55] <wescotte> I have a damaged SDCard that is preventing my pi from booting. I setup a new card but I want to attempt to recover some of the data off the old card. However, it appears the the data is in images/myOSName.img192 How do I extract this file so I can attempt to recover some of the data? [20:55] <Habbie> wescotte, that's a very specific name, did some recovery tool invent that? [20:57] <Habbie> oh so that's an image of your SD? [20:57] <wescotte> Yes, using Noobs. [21:04] <wescotte> the images/ folder has my operating systems listed as I described.. I don't see any other data on it. [21:11] <wescotte> jacekowski, getting a "failed to use device: No such device" is there any other args I'm suppose to be passing? [21:12] <Habbie> what args did you pass? [21:15] <wescotte> ok.. so just sudo losetup /path/to/imgfile creates a /dev/loop## which I can then mount as normal? [21:21] <Habbie> any luck with your data? [21:29] <wescotte> Thanks for all the help guys! [21:32] <Encrypt> Has anyone here bought this screen: https://www.amazon.fr/tactile-interface-capacitif-Monitor-Raspberry/dp/B071R2LMPH/ref=cm_cr_arp_d_product_top?ie=UTF8 ? [21:41] <H4ndy> Unicorn437: do you have Spotify Premium subscription?